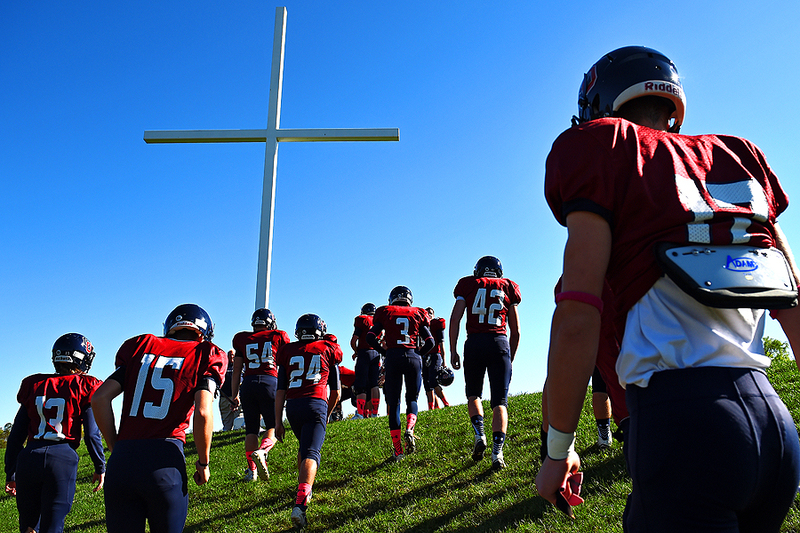 "Lead by interim head coach Paul Strus, the Cardinal O'Hara football team walks to a large cross to pray before playing Bonner Prendergast Catholic at Cardinal O'Hara High School on October 26, 2014 in Springfield, Pennsylvania." I'm always seeking powerful stories and interesting people. These ideas for stories come from a range of things - from combining my own interests, to pitches from friends and those who contact myself, and everything in between. This summer, I came across the story of Cardinal O'Hara beloved football head coach Danny Algeo. I found out about the story from a photojournalist friend closer to the story. Algeo, 49, died of a heart attack over summer and his death left the community in shock. I quickly learned that coach lived by a motto of faith, family and football. He was one of those coaches that everyone wanted leading their team, as well as, guiding their young men into adulthood through football. This instantly sparked my interests and I wanted to know more about his past, the team and the community in Springfield, Pennsylvania. Working on a personal story of religion and sports for an extended period of time and I have been doing my best to document images I feel help tell that story. After talking to the interim head coach in detail, I knew I had to try and find time to get up to the field. The school has a large cross near the field that was a project of Algeo, and has since served as a memory of the coach's legacy - not only to players and other coaches - but those in the community. My schedule had been really busy, but I finally found a morning to go up to document this moment of grace. I appreciate the team for having me and I hope we cross paths again.